Born in Ecuador and raised in the Bronx, Oscar Bermeo is the author of the chapbooks Anywhere Avenue, Palimpsest, Heaven Below, and To the Break of Dawn. He lives and works in Oakland, CA. I remember randomly tuning into an episode of Fringe about three years ago in the middle of their second season and thinking, “What’s with this X-Files rip off and why the hell is Dawson’s Creek in it?” It didn’t help that this particular episode involved quite the bit of time travel, paradoxical looping and, to add to the random, Peter Weller of Robocop fame. It became a bit much and I tuned out as fast as I tuned in. Flash forward a couple of months to the series finale of Lost, another JJ Abrams series that I got completely immersed in, and was also chomping at the bit to see how this modern mythology would end. Looking back now, my evaluation of Lost was affected by how much I loved the series and ended up giving the writers and creators way too much leeway with their finale. Looking back, I am disappointed in how they one of TV’s most original mythos and gave it not just a pedestrian ending but also a US ending where everything is fine in the end. Ugh! Lost should have been the epitome of tragedy, an island where all souls, no matter how noble or twisted, have already squandered their chance at redemption. Yeah, I’m still bitter about it. 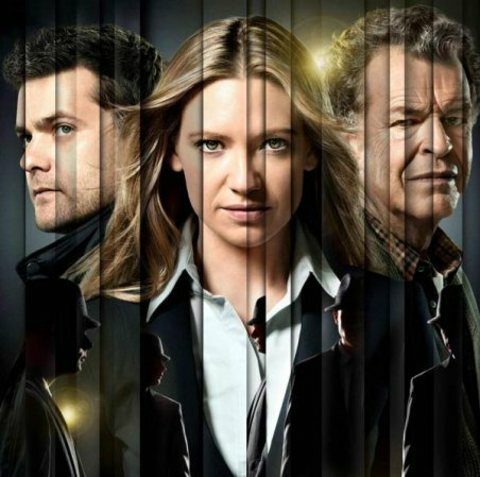 But now Fringe, the series that took over for Lost has a real chance to be more than an X-Files clone or another Abrams series, it can really be a hallmark for a lost art in US TV writing, a true American tragedy. This is the most obvious of the four since last Walter came out and said it in last week’s episode. While obvious, it would still be the most satisfying for me since it makes the most logical sense: Walter’s hubris has been the source of nearly all the calamity in the Fringe universe. In the ‘normal’ timeline, Walter stole Peter from the alternate universe in complete defiance to the laws of man, God and physics. Not only did Walter break the universe but he also ended up indirectly killing or maiming his wife, lover, best friend, adopted daughter while also alienating his best friend and newly adopted son. The first four seasons of Fringe have been primarily Walter trying to repair the harm to both his family unit and the universe at large. While actually succeeding on a surface level, our Walter never quite was able to fix everything. In the ‘Other’ universe, Walternate set off a large-scale assault on the normal universe in response to his son being stolen. Though it hasn’t been mentioned in the canon of the show, I kept seeing clues that Walternate set off a larger tragedy that the Other Side blamed on our universe in an attempt to give his Fringe division wider ranging powers. Though Walternate has every justification to be pissed, he also shares our Walter’s hubris and has done his own fair share of universe breaking and family scarring. And our current version of Walter is a little softer and just as goofy but started off as a killing science machine willing to do anything to destroy the Observers. His intellect so out of control that he craved a second forced lobotomy for fear his intellectual war with the Observers would lead him to abandon his humanity and challenge them on an individual level. All to say, whatever he does, wherever he goes, Walter can’t help but break the fabric of reality apart. This finale gives him the chance to stop tinkering with the rules of relativity and offer himself as sacrifice. It’s only fitting considering how much damage he’s done and the tragedy would be that he could never truly fix what he has broken. This would also give John Noble a chance for one last over the top performance that may actually get him a richly deserved Emmy for crafting sci-fi’s most memorable Twizzler loving mad scientists. Gotta give Joshua Jackson a lot of credit for not banking in his Dawson Creek fame and finding a different challenging role which he has definitely done with Peter Bishop. Peter has always been the person out of sync with the universe but ironically is usually the most natural guy in the room. Jackson plays him very deftly even though the writers haven’t given Peter a whole lotta depth, they’ve given him a big chunk and important part in the mythos but it never feels like Peter has changed too much over the run of the series. Making this the perfect time for him to sacrifice himself. Well, this would be the second time he’s given up his life to save the universe(s) and while it bit shocking it wasn’t entirely tragic. This season, Peter went over to the dark side and found out how much like his father he really is. Maybe that added element and the resulting scene of Walter grieving can up the drama level and also give Joshua Jackson some added motivation. While not my preferred ending I would be happy to see Peter, the boy who was always meant to die, find out he couldn’t shake fate no matter how hard his father and family tried. The last few episodes have been definitely lacking in Anna Torv and that’s a damn shame given how much gravitas she’s added to the series. Season after season, Olivia has been the character you could always count on to be put in danger and find her way out of it giving sci-fi a new heroine to cheer for. But much the same way the progressive multi-cultural casting of Lost dwindle down to a few Anglo males and one Anglo women who loved them, the Fringe writers have forgotten that Olivia really has been the straw that’s been stirring the drink the last 99 episodes. I hope they’ve just been playing their cards close and not revealing that Olivia, Walter’s metaphorical second child, is one of the biggest victims of Walter’s mechanizations. Could her sacrifice be what finally forces Walter to stop playing God? Maybe. It would make for one hell of an end scene and leave the Bishop boys have to learn to live with each other without anyone else to help them. This would be the lamest end the writers could dream up. Even if Astrid or September or the boy Observer or the whole Other Universe dies in the place of our heroes, it would be just a slap in the face to the viewers. Well, the readers who like really drama, which seems to be a smaller and smaller fraction of the US viewing audience who seem to be more invested with ‘reality tv drama’ then staged drama. Ironic, considering how staged reality shows are and how more true to life art can be. Or should be. Fringe has done a great job of showing us the horrors of a fractured multiverse all because one man wanted to save his son. Bold. Noble. Wrong. So so wrong and the viewers have gone through five seasons of the consequences of this most selfless and selfish of acts. The reward should be watching one of the key characters finally feel the full weight of that act. To do otherwise would cheapen the journey. I only mention this because of the Lost finale. I still shake my head when I think of the final scene between Ben Linus and John Locke, two wonderful characters played by a pair of brilliant actors who played off each other wonderfully, after six seasons of being at each other throats (literally) they all sum it up with an “I’m sorry” (for destroying all your dreams and manhood, betraying you at every turn and then choking you to death with my bare hands only to see your dead body used like a puppet) followed by an “It’s ok” (that you lost everything you ever cared about including any semblance of a soul only to be still trapped in this purgatory as a subordinate). Luckily, Fringe has learned a lot of lessons from all the previous JJ Abrams’ series and didn’t hold out to long on mysteries, never let the mythos get ahead of the writers and always kept placing their bets on their three principal actors. A great formula that has produced a great show and, hopefully, a suitably rich tragic finale. Laura Jew is an Oakland native, a tough mudder, baking lover, and a student in her final year at Mills College. She is a proud fellow of Kundiman, a program for Asian American poets, and a recipient of CSU Chico’s annual creative writing award. Her poems have appeared in Watershed and, more frequently, on the desks of her professors. Lauren Peck is a Southern transplant in pursuit of adventure and has one of those MFA degrees in Creative Writing. She’s primarily a poet, but is also currently writing a work of short stories about the misperceptions of monsters. She collects old love letters and lives in Oakland. Born in Ecuador and raised in the Bronx, Oscar Bermeo is the author of four poetry chapbooks, most recently, To the Break of Dawn. He has taught creative writing workshops to inmates in Rikers Island Penitentiary, at-risk youth in the Bronx, foster teens in San Jose, bilingual elementary students in East Oakland, and to adults through the Oakland Public Library’s Oakland Word program. He is a Bronx Recognizes Its Own, CantoMundo, SF Intergenerational Writers Lab and VONA: Voices of Our Nations Arts Foundation poetry fellow. Full Menu of delicious sausages, baked goods, and beverages. Plus $2 PBRs. 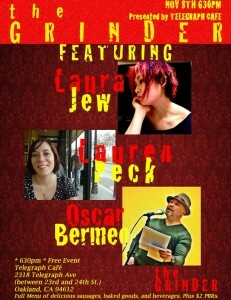 I’m honored and excited to host this event tomorrow at LitCrawl. These are some amazing writers who are really invested in both their stories and their connection with community and I know they’ve been workin hard to make sure that this is THE event people will be talkin bout during LitCrawl. Y’all should come out and support the poetry and enjoy the lumpia. 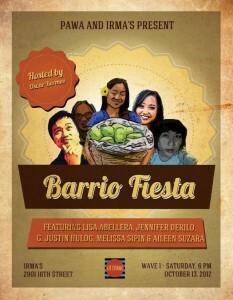 PAWA is partnering with Irma’s Restaurant to bring you Barrio Fiesta: a reading where five writers will share work about a celebration. The celebrations will be culinary, cultural or focused on the community. In the spirit of every good Filipino Barrio Fiesta, lumpia will most likely be served. Featuring Lisa Abellera, Melissa Sipin, G. Justin Hulog, Jennifer Derilo, and Aileen Suzara. Hosted by Oscar Bermeo. LISA ABELLERA earned her MFA in Creative Writing from the University of San Francisco. Her work appears in The Southeast Review, Lowestoft Chronicle, and The Globetrotter’s Companion (Lion Lounge Press), an anthology of creative travel writing. She lives in the San Francisco Bay area, where she is currently at work on a collection of short fiction. JENNIFER DERILO has a BA in Literatures of the World from UC San Diego and an MFA in Literature and Creative Writing from Mills College, where she was its first Jacob K. Javits Fellow. She is the Creative Nonfiction Editor for Kartika Review and an English instructor at Southwestern College. She enjoys writing and reading about people and things unseen. She often has nightmares about zombies. And abandoned predicate parts. G. JUSTIN HULOG writes stories about ruined gods, forgotten spaces and new worlds. Born in Baguio City, he grew up in California before leaving home to study Comparative Literature at Columbia University. He has written for Hyphen, Remodelista, Karma Magazine and edits a Filipno food and bulul blog called The Palay. Justin is currently completing his MFA in Creative Writing at San Francisco State University. MELISSA SIPIN is a writer from Carson, California. She was nominated for a Pushcart Prize in 2012 and her writing has been published or is forthcoming in Kweli Journal, Tidal Basin Review, and Kartika Review, among other publications. Melissa was awarded the full-tuition assistantship in narrative writing and community engagement at Mills College and is currently pursuing her MFA in fiction. AILEEN SUZARA is a Filipina/American educator, cook, eco-activist, organic farmer and adobo champion. She finds inspiration in the power of story to create change — from the voices of climate change fighters to the oral histories of California’s AAPI farmworkers. Aileen’s writing appears in The Colors of Nature, Earth Island Journal, Growing Up Filipino II, and more. She blogs on food, memory and place at Kitchen Kwento. 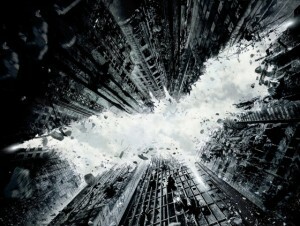 With all the news and hype surrounding The Dark Knight Rises it’s been tough to avoid spoilers, extended trailers and news articles that give away way too much of the movie but here I am ready to see if Christopher Nolan can pull off the superhero movie trifecta. A task that eluded the filmmakers of Superman, X-Men, Spiderman and the original Batman run and made even more daunting by the fact that The Dark Knight is one of the best sequels I’ve ever seen, period. The fact that it happens to be based on the collective stories of one of my first literary heroes just happens to be a bonus.